Rick DiPietro won for the 100th time in his career and was rewarded with a 2-1 victory over the Rangers and the first star of the game Monday night. 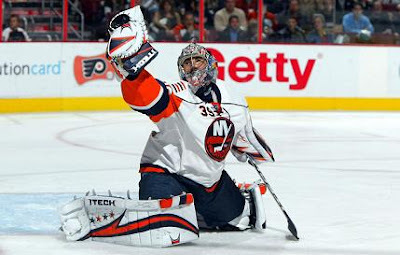 Perhaps it was fitting that DiPietro earned his 100th victory at Madison Square Garden because he has not had more success against any other team than the Rangers. Overall he is 10-11-2 against them, but he is 3-0-0 against them this season and 8-1-2 and a 1.89 GAA during the last 11 games he has played them. "They're a tough team ... but we've played well here and played a big road game tonight," said DiPietro to the NY Daily News. "It's always a physical game; every time you come to this building you expect to have a wild first 10 minutes. The biggest thing is to maintain your composure, even though I obviously lost mine a little bit." He lost his composure when he punched Sean Avery and received a roughing penalty for it. DiPietro missed eight games last season including one in the playoffs against the Buffalo Sabres after he sustained a concussion due to a hit by Avery on March 25 last season. Avery was mostly kept quite throughout the game. He received eight penalty minutes during the game, but was in the box even longer than that as there was no stoppage of play for over three minutes after a double minor. In total he spent over 11 minutes in the penalty box. Offensively he was very quite registering only one shot. For more NY sports go to www.hotstovenewyork.com.